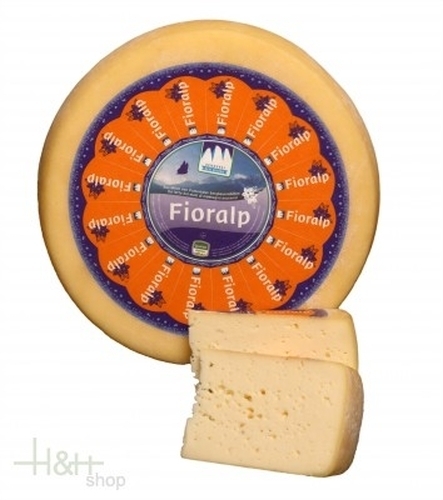 Fioralp cheese Alpine Dairy Three Peaks approx. 500 gr. Buy now this product together with Cheese Dolomites emperor dairy Three Mountains appr. 500 gr. ready for shipment: in stock Cheese Dolomites emperor dairy Three Mountains appr. 500 gr. Buy now this product together with Rosy Goat's Cheese in Moscato Rosa wine DEGUST app. 650 gr. ready for shipment: in stock Rosy Goat's Cheese in Moscato Rosa wine DEGUST app. 650 gr. Mountain Ham Steiner approx. 400 gr. Delicacy in the Tirol kind which leads back his origin on the Easter party feast. The imperial part of the pig, salted, smoked and matured, stood in days of yore in the centre of the culinary Easter banquet. The Mezet bacon disposes of a little bit more white bacon interest and is milder therefore and more delicately in the taste. Mountain cheese Superior South Tyrol appr. 500 gr. - Dairy Three Peaks 10,40 EUR / 20,80 €/kg. only 194,45 EUR / 20,26 €/kg. Rieserferner Cheese of raw milk approx. 3,5 kg. Neuhaushof 69,45 EUR / 19,84 €/kg. Luce Cheese DEGUST approx. 600 gr. 39,05 EUR / 55,79 €/kg.